A court in China has sentenced the brother-in-law of imprisoned Nobel Peace Prize winner Liu Xiaobo to 11 years in jail on fraud charges. The lawyer defending Liu Hui said the jail term was out of all proportion to the alleged offence. He said it should have been treated as a civil dispute, not a criminal matter. Liu Xiaobo was already in jail when he won the Nobel prize in 2010 for campaigning for peaceful democratic change in China. Since then his wife, Liu Xia - sister of Liu Hui - has been held under strict house arrest in what she says is an official vendetta against his family. The BBC's John Sudworth, in Shanghai, says this latest sentencing of a close family member is being seen as further political persecution. It comes at the same time as China's President Xi Jinping is in America for talks with President Obama, a summit at which the US side says the issue of human rights is being raised. The court in Huairou, north-east of Beijing, convicted Liu Hui, a manager in a property company, of defrauding a man of 3m yuan ($490,000; £315,000) along with a colleague. "As Liu Hui's defence attorney I definitely do not approve of this verdict, because we see this fundamentally as a civil issue, and it fundamentally does not constitute criminal fraud," lawyer Mo Shaoping told reporters. He said Liu Hui maintained his innocence. A tearful Liu Xia accused the authorities of persecuting her family. "I absolutely cannot accept this. This is simply persecution," she said before being driven away from the court. "This is completely an illegal verdict." She said she had "completely lost hope" in the government, adding: "I can't even leave my house." 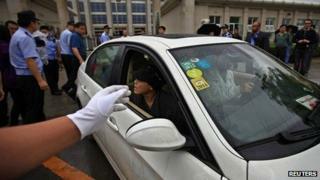 Police pulled journalists away from the car as Liu Xia was driven off. Liu Xiaobo, who won the prize despite fierce Chinese opposition, was jailed in 2009 for helping to draft a manifesto - Charter 08 - calling for political change. He is currently serving 11 years in jail for inciting the subversion of state power. Liu Xia, also a known activist, has been living in her Beijing apartment with no internet or phone access and limited weekly visits with family. She had been allowed to leave her apartment to attend the court hearing.